THE NEW BIG TIRE GARAGE! and functional as it is strong. Miracle Truss® Buildings are designed for the do-it-yourselfer and are manufactured by quality oriented craftsmen right here in the United States. Miracle Truss® Buildings hybrid web steel truss buildings are a great fit for almost any need. Our clients love the clear span ceiling as well as the flexibility that the design offers for insulating and finishing. We are a family run, veteran owned business and our manufacturing facility is centrally located – we ship our building kits to all 50 U.S. states, Canada and overseas. Every Miracle Truss® Building package comes with a 50-year Frame Warranty and are designed to be just as beautiful and functional as they are strong. Heavy snow and high wind areas can benefit from the strength of the Miracle Truss® design. We are competitively priced, but do not skimp on the little things that make a big difference to the strength, quality, and usability of your building. 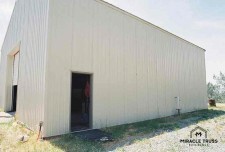 Feel free to explore our site to learn more about our DIY hybrid metal buildings and request our free building literature if you’d like to learn more. Give us a call today at 800.208.1969, or click here to have us contact you. Edge mounted purlins and girts are already there to work off of! Easily install doors, windows, run your electrical, and insulate just like standard wood frame home construction with the hybrid design. No retrofitting of an interior stud-wall needed. Pre-fabricated steel columns bolt directly to concrete. No welding required. With steel legs, there are no wood posts in the ground left to rot off and no clumsy wood framing to worry about getting perfectly plumb from scratch. Steel legs go up straight, solid, and won’t rot. Period. Side mounted purlins and side girts are edge mounted to provide strength and allow for a variety of finishing touches, including batt-style insulation. Built similar to how bridge trusses or crane-booms are built, web trusses are designed to take advantage of the strength of dimensions and materials. Build it once. Let the wind blow or the snow fall or both, and never have to worry about what you are storing inside when mother nature brings her fury. No flat ceilings or low hanging rafters to get in your way. More usable interior space gives a nice open feeling while inside the building and allows for car lifts, maneuvering large materials inside, flexibility to add a loft for multiple uses, and even room to hang a chandelier to finish out your man cave! Miracle Truss Buildings are proudly made in the USA by quality craftsmen. They’re built strong with recycled American steel and come with an impeccable 50 year warranty.